Home » The month that E.T. came to D.C. The month that E.T. came to D.C. 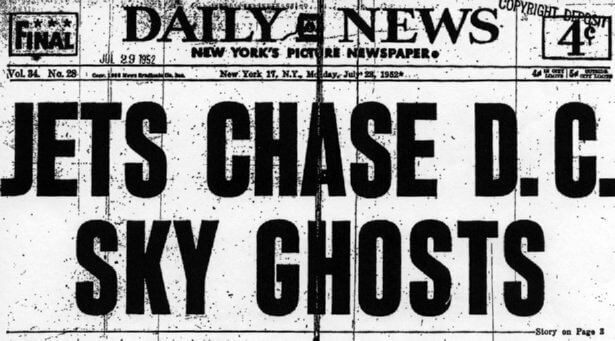 Above: Front page of The Washington Daily News on July 28, 1952 following an alleged UFO sighting in the D.C. metropolitan area. (The Washington Daily News/THE WASHINGTON DAILY NEWS. You’ve written recently about weather balloons in Washington. How about weather balloons that weren’t weather balloons? In July 1952, Washington was supposedly visited by multiple unidentified flying objects — or “flying saucers,” as all UFOs seemed to be known at the time. Can you look into this? This month marks the 60th anniversary of the Great Alien Invasion of 1952 or, as it might more appropriately be called, the Great Alien Reconnaissance of 1952. The UFOs allegedly just flew around; no one saw them land. But were they aliens? This much is undisputed: Late on the evening of July 19, 1952, air traffic controllers at Washington National Airport spotted a curious cluster of seven blips on their radar screens. Similar blips were sighted by radar operators at Andrews and Bolling Air Force bases. Illusions don’t, but temperature inversions do. A temperature inversion occurs when a layer of cold air is trapped under a layer of warm air. It’s most common in extremely hot weather of the sort that Washington was enduring 60 summers ago. The warm air can create a ceiling that causes radar beams to bounce down. Objects on the ground — moving cars, a row of telephone poles — can appear to be thousands of feet in the air. An Air Force officer ascribed the sightings to this phenomenon. But what of the lights? A layer of moisture in the atmosphere could have caused reflections. While there certainly are more things in heaven and earth than are dreamt of in Answer Man’s philosophy, he must side with the skeptics in what became known as the “Washington Flap.” Even before that hot July, the papers were full of stories about UFOs. They were a staple of science-fiction movies in an America fearful of a Soviet invasion. Humans make sense of the world by building narratives. A random but humdrum collection of events — temperature inversions and, yes, weather balloons — is somehow not as satisfying as a flying saucer. It seems to Answer Man that asking whether there were any alien spacecraft over Washington in 1952 is like asking whether there were any witches in Salem, Mass., in 1692. There is just one week left in our campaign for Moss Hollow, the summer camp for at-risk kids from the Washington area. Our goal is to raise $500,000 by July 27. We stand at $253,833.66. Give now and a donor will match your contribution. What’s more, donors of $150 to $249 will get a $25 Clyde’s gift certificate. Those who give $250 or more will get a $50 coupon. To give, go to washingtonpost.com/camp. Click where it says “Give Now,” and designate “Send a Kid to Camp” in the gift information. Or mail a check payable to “Send a Kid to Camp” to Send a Kid to Camp, P.O. Box 96237, Washington, D.C. 20090-6237. You’ve written recently about weather balloons in Washington. How about weather balloons that weren’t weather balloons? In July 1952, Washington was supposedly visited by multiple unidentified flying objects — or “flying saucers,” as all UFOs seemed to be known at the time. Can you look into this?You’ve written recently about weather balloons in Washington. How about weather balloons that weren’t weather balloons? In July 1952, Washington was supposedly visited by multiple unidentified flying objects — or “flying saucers,” as all UFOs seemed to be known at the time. Can you look into this?